The St. Joseph congregation was organized in the month of January, 1920 by the Reverend Daniel J. Quinn. Right Reverend James Ryan, DD, gave the new pastor permission to say Mass in the home of Mrs. Mary Johnson until a church could be built. The first Mass said by Fr. Quinn in Chatham had an attendance of twelve adults and fifteen children. In addition to the Johnson residence, Masses were also celebrated in the home of Michael Evoy. The parish was started by nine English-speaking families. These people, although not having much of the world's goods, donated freely and did a great deal of the labor in building the church. They were willing to make any sacrifice in order to have a church. There were no contracts to build the church on account of the poverty of the congregation. The pastor himself superintended the work and hired the men by the day. In this way, the modest little church was built at a reasonable cost. The first St. Joseph's Church was located at 211 East Chestnut St in Chatham. The non-Catholics of the community be it said to their credit, showed their good will by offering their services freely in helping to build the church. The cornerstone was laid July 20th, 1920 with seventeen priests and a large number of people taking part in the ceremony. The church was built of brick with a large hall below, which was used for parish social affairs. The church grew to a parish of eighteen families and was an out-mission of Auburn attended by Fr. Quinn on three Sundays of the month. St. Joseph the Worker Parish was dedicated by Bishop James Ryan in July 1920. Since the first St. Joseph’s Church was dedicated, 13 other priests have served the parish: Father Charles Sandon, Father Thomas O’Neill, Father George Link, Father Francis Hogan, Father Jerome Jacek, Father Charles Englum, Monsignor Casimir Toliusis, Father Bernard Wyzykowski as non-resident administrators and Father Thomas O’connor, Father Zvonimir Damjanov, Father Martin O’Hara, Father Robert Franzen as resident pastors. In July, 2007, Bishop George J. Lucas, DD appointed Father John Nolan as our fifth resident pastor. Fr. Dennis Kollross was appointed pastor in July of 2013. Following the death of Fr. Kollross in May of 2015, Fr. Nolan was appointed as Administrator and then again as resident pastor in July of 2016. Annual statements issued to the parishioners in 1942 indicated parish receipts for $813. 61 with expenses equaling the same. $478.00 was spent to remodel the small white frame church. In 1943, income rose to over $1000.00; repairs to the church were over $500.00. In 1963, Msgr Toliusis began a drive for contributions for a new church since the parish had outgrown the original building. Father Thomas O’Connor, appointed pastor on January 1, 1969, continued these efforts towards a new church. Fr. O’Connor, being the first resident pastor of Chatham, purchased a rectory at 711 East Chestnut. This rectory was later sold and another one purchased closer to the site of the new church at 629 East Spruce. A “Rectory Shower” and reception to meet Father O’Connor was held in the Chatham Community Building in the form of a “potluck.” The ground was broken for the new church on June 28, 1970 at the southwest corner of Spruce and Ball Streets (700 E. Spruce), and was completed in 1971, at a cost of $165,000. This was to be paid off in twenty years, but through the sacrifices of the parishioners this debt was retired in nine years. The vacated church at 211 E. Spruce was sold in 1974 for $34,500.00 The first Mass was offered on Wednesday, August 4, 1971, with approximately 75-80 families in the parish at that time. Bishop William A. O’Connor officiated at the dedication ceremonies in October of that same year. Thomas Gorey and Daniel J. Lonergan were the first trustees of the parish. They were succeeded by Leo Milner, Paul Lonergan, and Gerald Corrigan. Today Joseph Moore and Bruce Thompson serve the parish corporation as Lay Trustees. A new 9,345 square-foot Community Center was started in November 1988 at a cost of $850,000. This addition, consisting of a multi- purpose room to provide classrooms with moveable partitions, a new kitchen, fellowship area, room for an eventual Preschool, and bathrooms was dedicated in January 1990. Mike Armstrong was the Lector, a dinner followed. Terry Bishop and Joseph Moore were serving as trustees. Moving back to an earlier time, the first three marriages celebrated in the Church of St. Joseph were that of Verna Fisher and Albert Mudd on June 25, 1924; the second was in the summer of 1929 between Ursula Fisher and Herbert Genck; and the third was held on the same date as the first, only 14 years later between E. Irene Boutwell and Leo Milner. Mrs. Mudd also served as a sponsor along with Harry Freeman, for the first Baptism at St. Joseph’s, the son of Mr. & Mrs. Birch Austin. The main money raiser for the church from 1950 to 1972 was an annual Chicken Dinner, was held in the Community Building. This project involved every member of the parish, which contributed to its great success. In 1973 because of the rising cost of the chickens and the fact they were difficult to obtain it was decided to change to an Ice Cream Social. The thirteenth Ice Cream Social was held in 1986. Some annual family counts: 1969—141 families; 1970—162 ; 1971—177; 1972—192. In 1986, the parish had grown to over 350 families with 783 individuals. In August of 1980, Sr. Pauletta Overbeck was appointed Director of Religious Education for the parish and served in that capacity until 1986. She was succeeded by Sr. Margaret Mary Byrnes and then (1994) Sr. Helen Vahling, who served as Religious Education Director for over 10 years until her retirement in 2004. At this time Deacon Tom Miller retired after more than three years of service to the parish. The year 1980, saw over 300 families in the parish. Some of the major groups active at this time are: Parish Council, Confraternity of Christian Doctrine for grades K-12, Christian Initiation of Adults, Catholic Youth Organization, as well as the Women’s Guild and Men’s Club. Through these organizations, the elected and volunteers, much vitality is added to our parish community. In 1995, the men’s and women’s groups were consolidated to form TEAM (Together Everyone Achieves More). 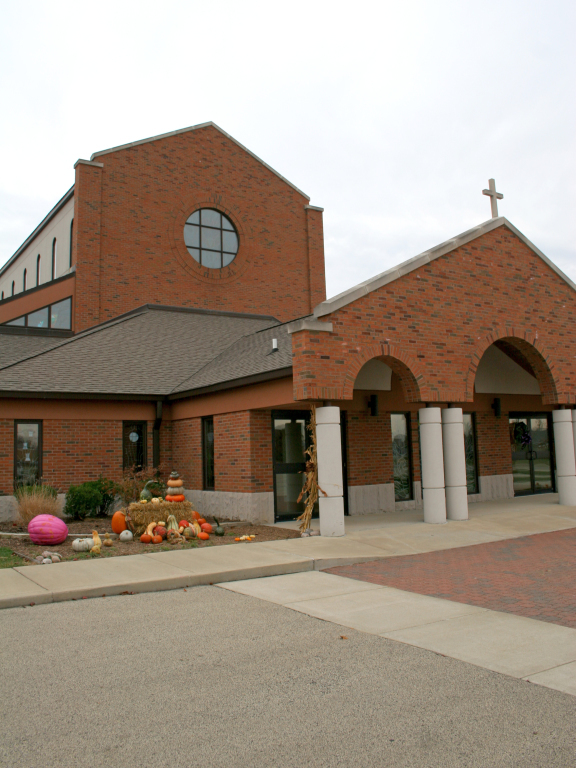 One year later (1996), the parish numbered over 650 families with more than 500 in our Parish School of Religion. The year 1997 saw the parish literally bursting at the seams as the members tried to squeeze more and more families into a church with a seating capacity of only 250. Parishioners coming late were seated in the Fellowship Hall, the Vestibule and Resource Room with video feeds from the Sanctuary. A capital fund drive, “Project 2000” was started with plans to add an entire new church building which would accommodate 725 worshipers. The plans also called for a Quieting Room, a separate Gathering Space, covered Car Port entrance and a Day Chapel to seat 30. After a year of selection, Crumlish & Crumlish from South Bend, Indiana, were hired as architects for this new worship space and in 1999, ground was broken for the new church complex at a cost of $2.5 million. In 2007, we are once again bursting at the seams with a membership of 1091 families and over 4000 people. Parishioners are sitting on temporary chairs in the Gathering Space. Our Faith Formation Youth number over 500 with 80+ catechists volunteering each week. The Parish of St. Joseph the Worker is that temple of living stones joyfully living the present while we move forward as a faith community to see clearly our centennial celebration in 2020. Our legacy is now; our future in sight.